If you can dream it, we can build a trip to fit! Opportunities for adventure here are only limited by your imagination! We can customize your trip to include anything from helicopter assisted glacier dog sledding to private deep sea fishing trips! 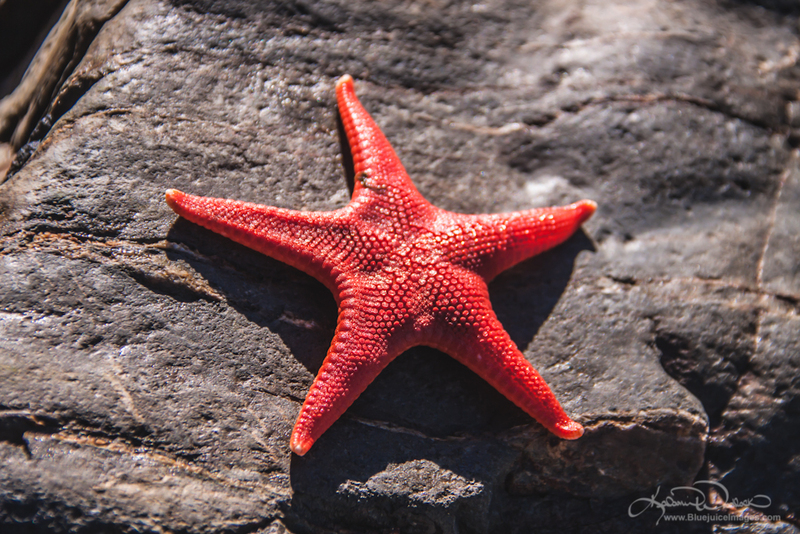 The ocean activities begin on our private beach that catches the afternoon sun, featuring booming sea caves, colorful tide pools, and a small salmon stream. Explore the rugged coast line by kayaking or paddle boarding with GPML's large top of the line fleet of kayaks, boards, and paddle gear. Bring your poles and try your hand at beach fishing for all the salmon varieties, wander up the stream to the waterfalls, or enjoy a bonfire and roast some marshmallows while watching the sunset. Feel like stretching your legs? Set your sights above the lodge for some world class hiking, wildlife viewings, mountaineering, and back country skiing. Explore hidden ponds and caves on your journey up through lush hemlock forest and climb unexplored ridges and peaks above gorgeous alpine bowls and streams for truly elemental views. The mountains go on forever from here... What are you capable of? You can reach Granite Point Mountain Lodge by an exciting landing craft ride provided by Seward Water Taxi (907-362-4101) or a scenic helicopter tour by Marathon Helicopters (907-769-3050). Are you interested in your own private boat for fishing or touring the bay? Check out Seward AK Boat Rental (907-362-0019) There is good anchorage in front of the property, so feel free to come out on your own private boats or kayaks. This is a remote setting and guests will be ascending four steep lofty staircases and traversing a short (30 yard) trail to reach the lodge. Travelers should be self reliant and in good physical shape. Backpack style packing is suggested. Avoid suitcases as you will be carrying your gear up the mountain. Bring appropriate gear for your particular pursuits. It is important to include sturdy hiking boots, full rain gear and insulation layers. Due to the steep terrain and proximity of the lodge to the cliff, children must be of at least 12 winters. For more information please read our FAQ's here. Accommodations here at Granite Point are top notch. A fully equipped gourmet kitchen complete with gas range, refrigerator, and breakfast bar, stand ready for all of your culinary desires. You will find high tech LED lighting throughout the lodge powered by a renewable energy system, and a unique rainwater catchment and gravity fed water structure. Relax after a long day of adventuring next to the inviting wood stove and curl up on our comfortable couches. When you are ready to retire there are two cozy bedrooms each with a Queen size bed with private views of the ocean coves below. With direct vent heating to keep you comfy and warm and a well equipped kitchenette this beautiful solid cedar cabin makes for a wonderful getaway and sports a truly magnificent view! 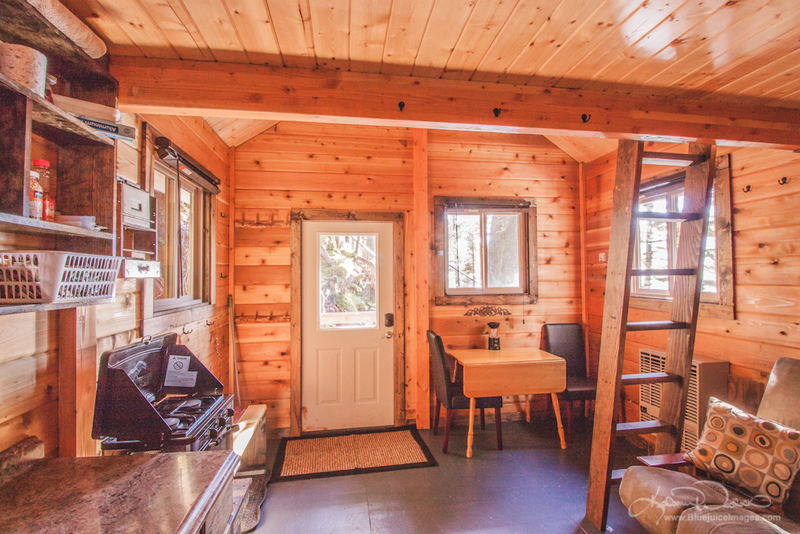 Just off of the beach this cozy solid cedar cabin with loft is our only beachside cabin on the lodge property and makes for the perfect weekend getaway! 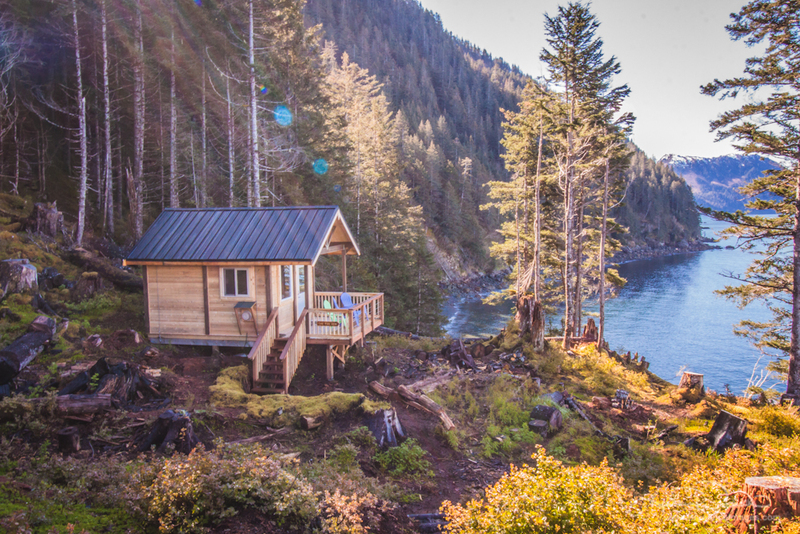 Nestled in the forest 500ft above the lodge this cozy cliffside cabin with filtered ocean views is a great place to really soak in all that Alaskan nature has to offer. Featured on Building Alaska! 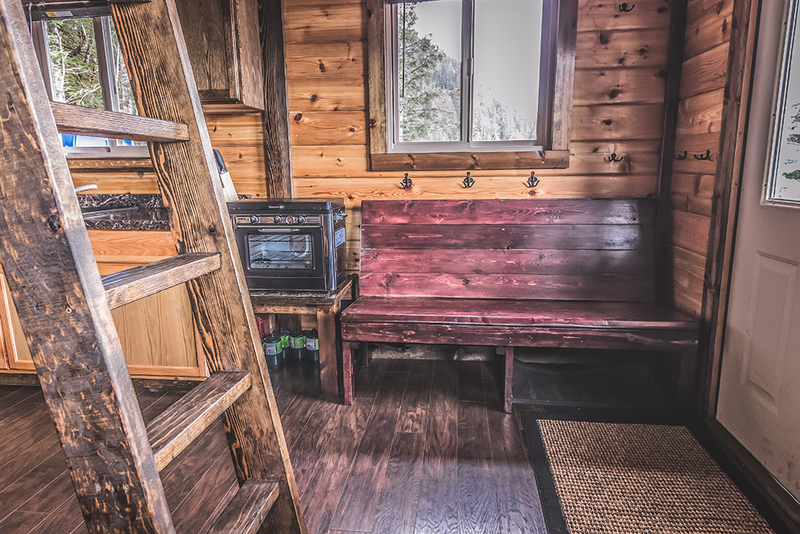 This beautiful solid cedar cabin is located on top of the cliff near the main lodge and features a well-equipped kitchenette with a two burner cooktop stove and small oven with pots, pans, dishes, silverware and cooking utensils. There are two queen beds to sleep up to 4 people and a deck to soak in the incredible view. Fox Den Cabin is available to be rented along with the main lodge for more room or on it's own with a 2-night minimum. The cabin is heated with a direct vent propane heater to keep you toasty warm in the evenings. 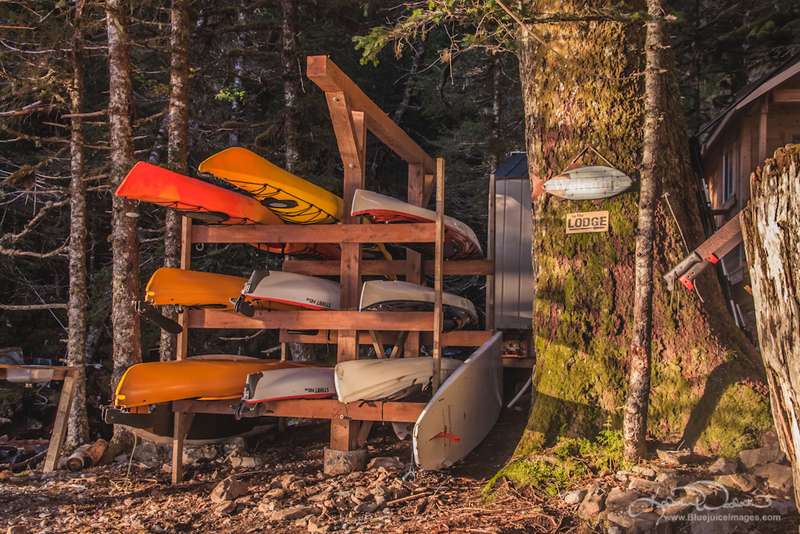 Use of kayaks and paddleboards are included with cabin rental. Just off of the beach this cozy solid cedar cabin with loft is our only beachside cabin on the lodge property. This cabin is equipped with a covered porch, propane heater and stovetop, LED lamp lighting, and a sink with basic kitchen amenities. After a day of adventuring retire to your choice of a queen size bed or queen size futon. Pepper Creek Cabin is available to be rented along with the main lodge for more room or on it's own with a 2-night minimum. Use of kayaks and paddleboards are included with cabin rental. 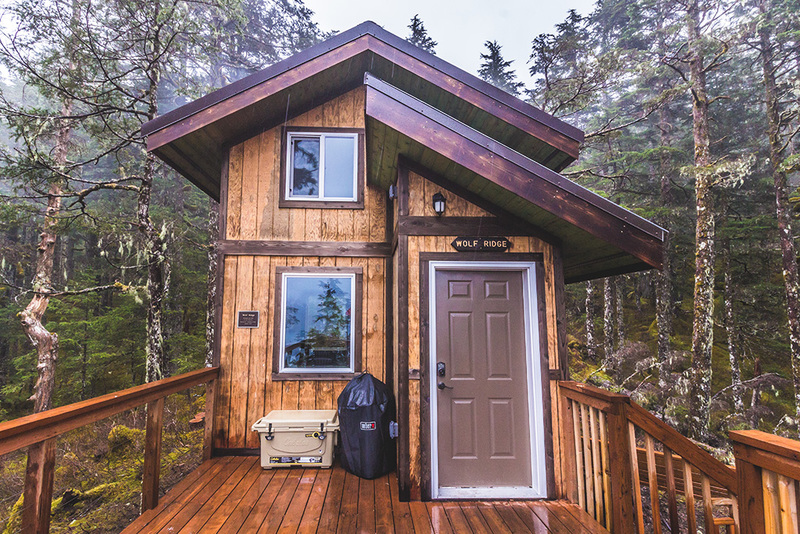 Nestled in the thick rain forest high above the lodge this private cozy cabin is the ultimate Alaskan adventure get-away! This special occasion custom cabin features a large deck with plenty of seating and a beautiful kitchenette with a rain dependent gravity fed water system and propane cooking services with a small oven. 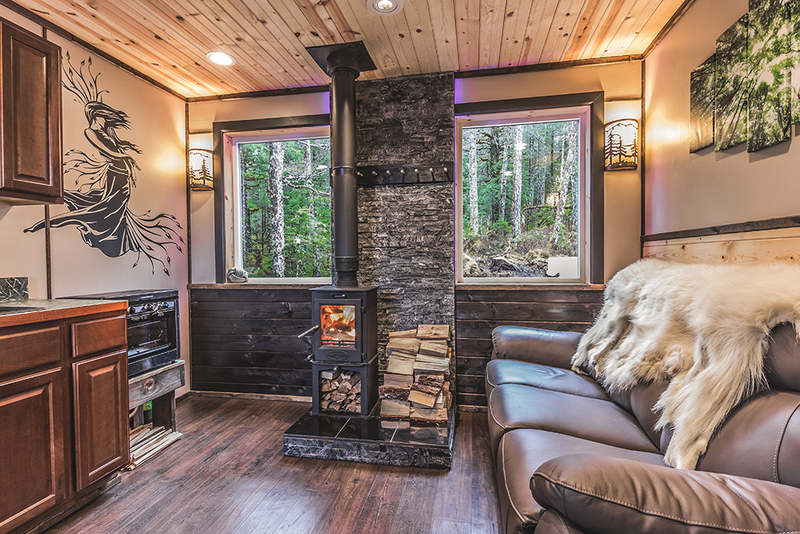 A ridiculously comfortable queen bed waits for you upstairs and the LED lighting throughout the cabin adds to the atmosphere while the fully stocked woodstove keeps you warm. Wolf Ridge is only accessible by a grueling 20 minute hike up a gnarly Mountain Trail, it is not for the faint of heart! 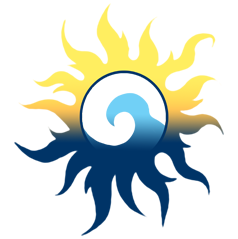 Experienced in shape backpackers only, bring a water filter to collect your drinking water if necessary and ice for the cooler. 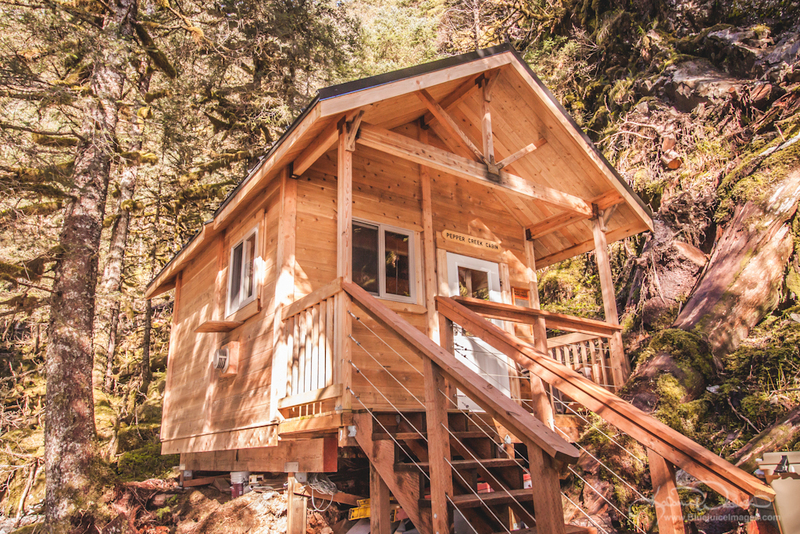 This cabin is featured on Building Alaska Season 8! Find episodes on the DIY network, iTunes, and Amazon Prime! Episodes are airing now on the DIY network. The lodge and cabins were incredibly difficult to build and has been an ongoing engineering feat. Being in a remote location and on top of a cliff plus the steepness of the terrain presented numerous building challenges that had to be overcome. Everything has had to be handcrafted in stages with a clear vision of the total finished project and an understanding of how this would fit into the flow of the land. Once that plan had been established, the work began with building stairs up to the top of the cliff and clearing land for the lodge. Six years of the most intense dedicated hard work has followed. Hundreds of thousands of pounds of lumber and building materials have been brought out to the property on several different boats; everything from tiny open skiffs in the raging winter to sturdy landing crafts and fishing boats in the salty summer. Over 100 helicopter loads have been long lined in from town, lifted off the beach and pulled from boats, and yet 90% of the materials have been painstakingly hand packed up the cliffside one load at a time. This project has been a labor of love to say the least and I know you will feel it when you wander these trails. 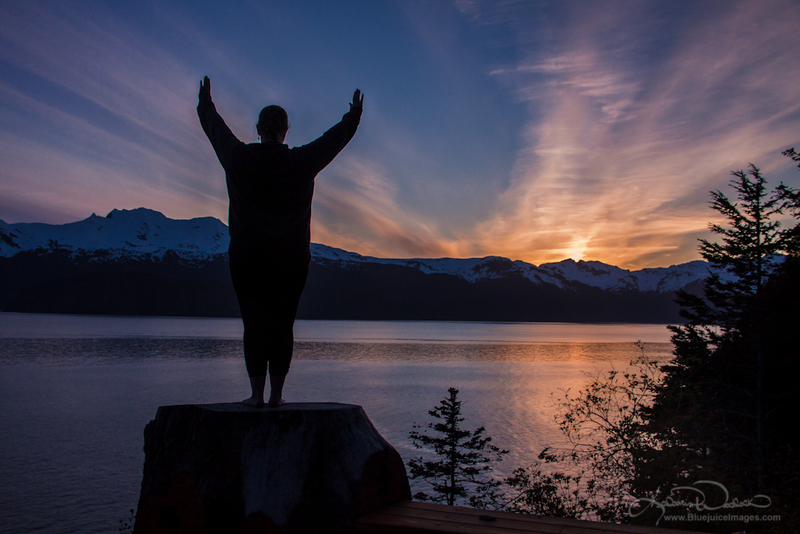 "I have lived in Alaska for over 20 years, spending most of my time exploring Alaska's wilderness by kayaking, hiking, back country skiing, boarding, hunting, and fishing. we were featured on the 8th season of Building Alaska! You can Find episodes on the DIY network, iTunes, and Amazon Prime!